We have secured funding for a new changing pavilion, which is currently under construction. This facility, alongside plans to replace or renovate the existing clubhouse, will help achieve our aim of building a stronger and more sustainable Roade Football Club at the centre of the local community. The new and improved facilities will help us to attract and serve a growing number of football, social and other community group users, with 21st century facilities that the entire community of Roade and surrounding villages can benefit from. Roade village is growing considerably in size, and with more football teams and social users there is a need for improved facilities, including the opportunity for other village organisations to be able to hire out the club's facilities. The newly-built changing room complex, incorporating kitchen and toilet facilities, will ensure compliance with the latest FA requirements, improve the match-day experience of players and create a more hospitable environment for spectators, thereby helping the club to continue to grow and accommodate more teams/age groups. The replacement or renovation of the clubhouse will increase its appeal to a wider audience, adding more usable space for social use and income generation. The improvements will also reduce the costs of heating, while security enhancements will keep insurance premiums lower. Donations or help with fundraising for the replacement or renovation of the clubhouse will be much appreciated. Please use the email link at the top of the page if you wish to support the club's ambition to improve our clubhouse facilities. Funding up to a maximum of £237,330 has been awarded by the Premier League & The FA Facilities Fund (PL/FA:FF). Funding up to a maximum of £50,000 has been awarded by The Football Stadia Improvement Fund (FSIF). Funding of £10,000 has been awarded by The Football Association National Sports Centre Trust (FANSCT). Thank you to Wilson Browne Solicitors for sponsoring our Reserves and Ladies Home Shirts for 2017-2018 and 2018-2019, as well as the 1st Team/Reserves Away Shirts for the same two seasons. In addition, for their programme sponsorship for our Six-a-side Junior Football Tournament in 2018. Roade FC is very grateful for the generous support given by Wilson Browne Solicitors to the club through these sponsorship deals. ​Thank you to Country Lion for supporting our Six-a-side Junior Football Tournament in 2018 through programme advertising. ​Thank you to Persimmon Homes who chose Roade FC as the Community Champion Winner for March 2016. Their donation has helped us on our way to the appeal target. 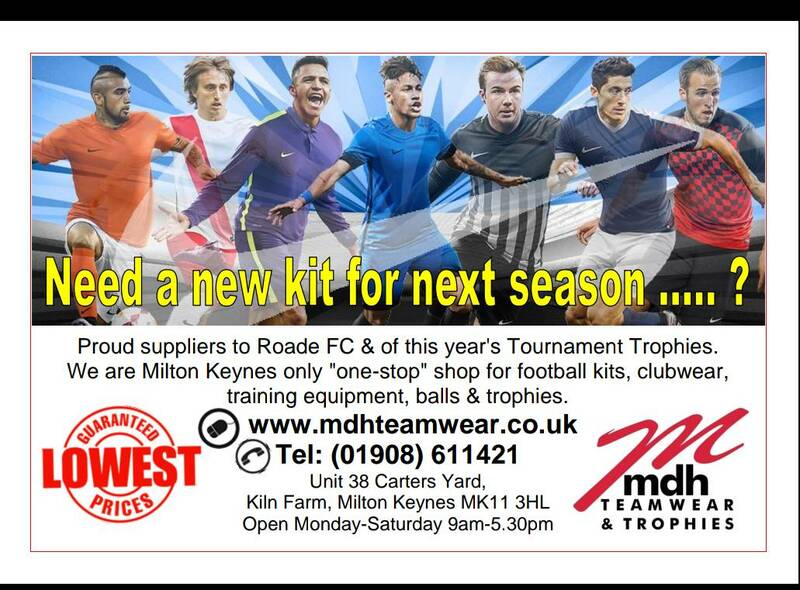 Thank you to Roade Main Garage who sponsored our highly successful Six-a-side Junior Football Tournament in May 2016. Roade Petrol Station handing over a cheque for £1500. Part of the money will be put towards the rebuilding of the clubhouse and the rest is sponsorship for the current U10s. Roade FC would like to thank Roade Petrol Station for this donation.